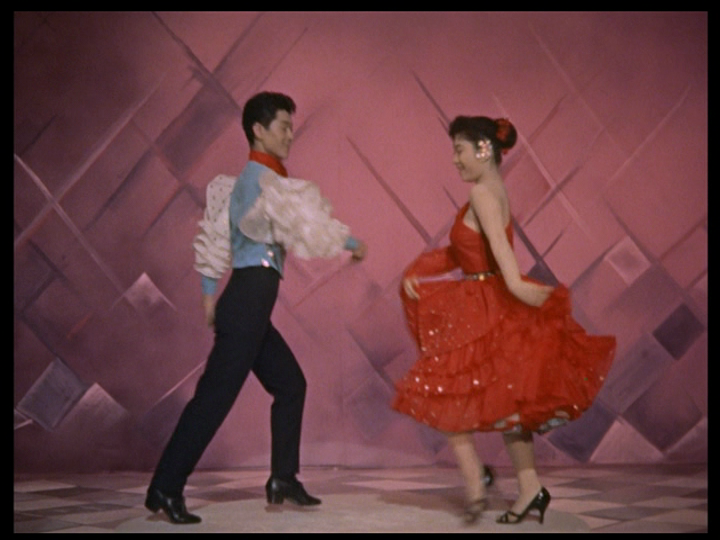 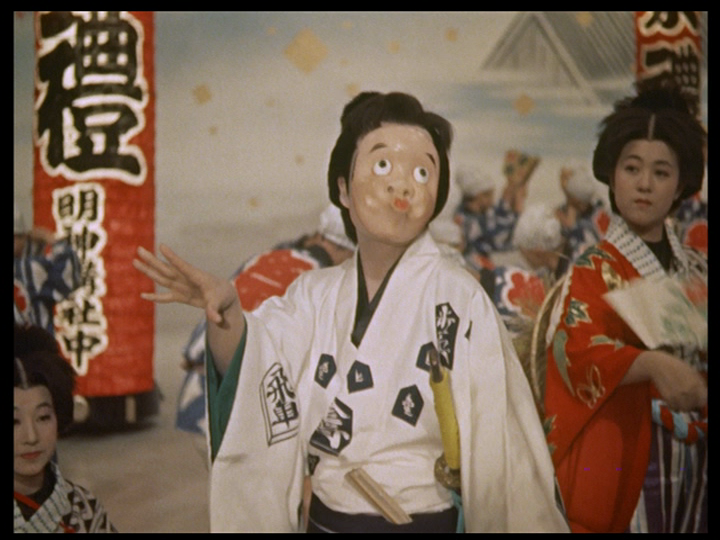 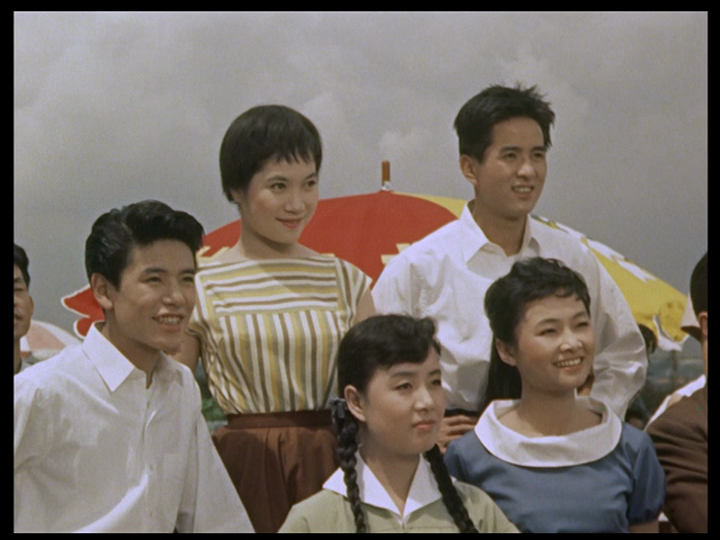 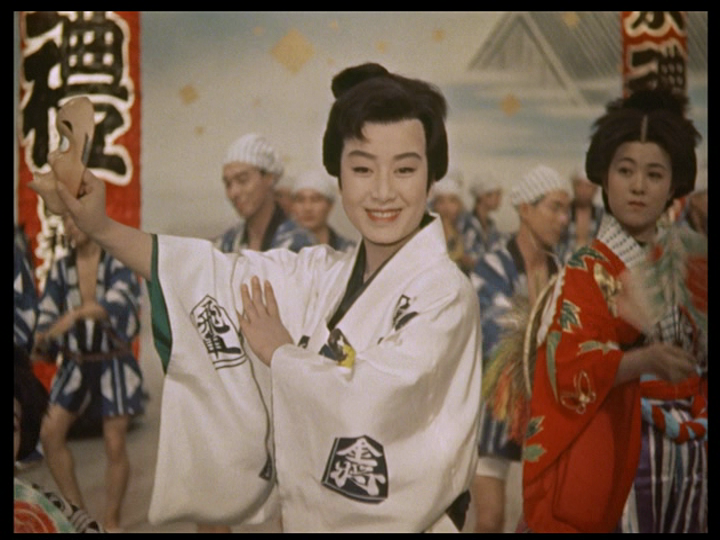 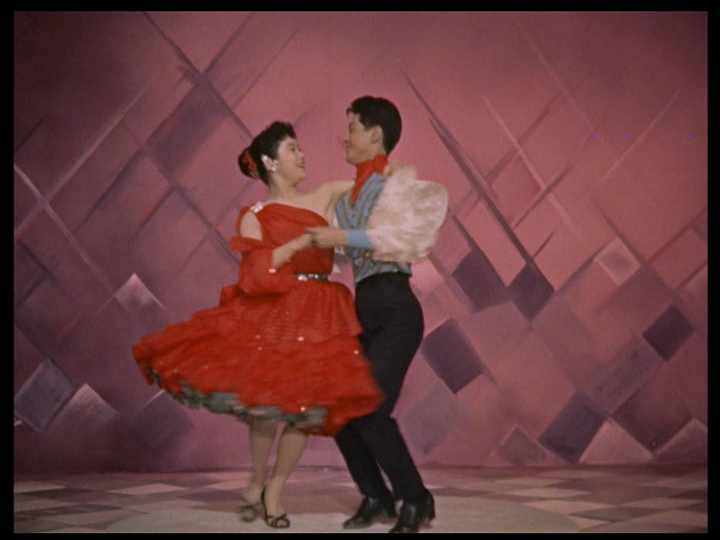 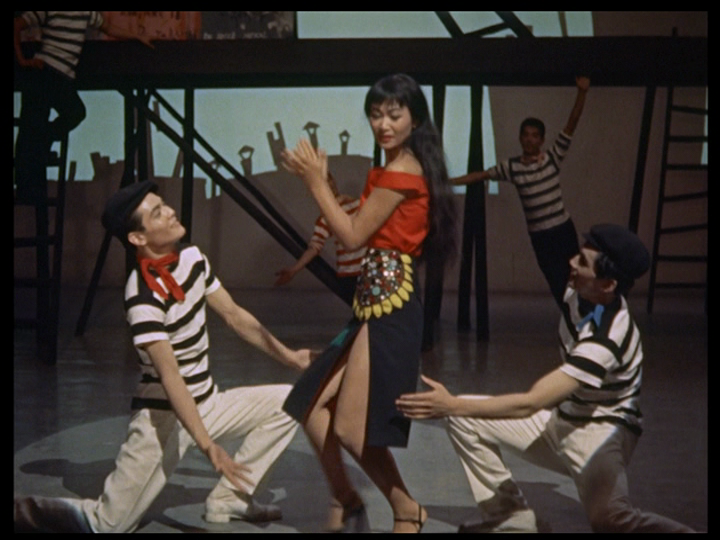 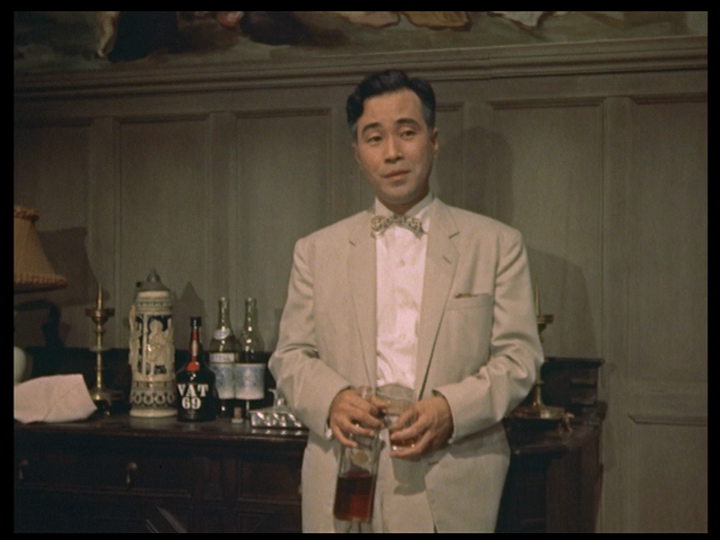 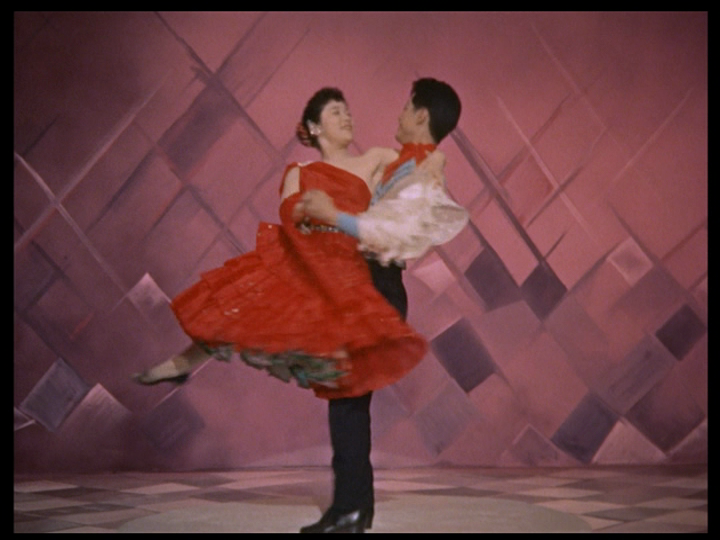 What was missing from these festivals back then were tons of Japanese comedies, dramas, and musicals from the 1950s that were made in color and hugely popular among Japanese audiences. 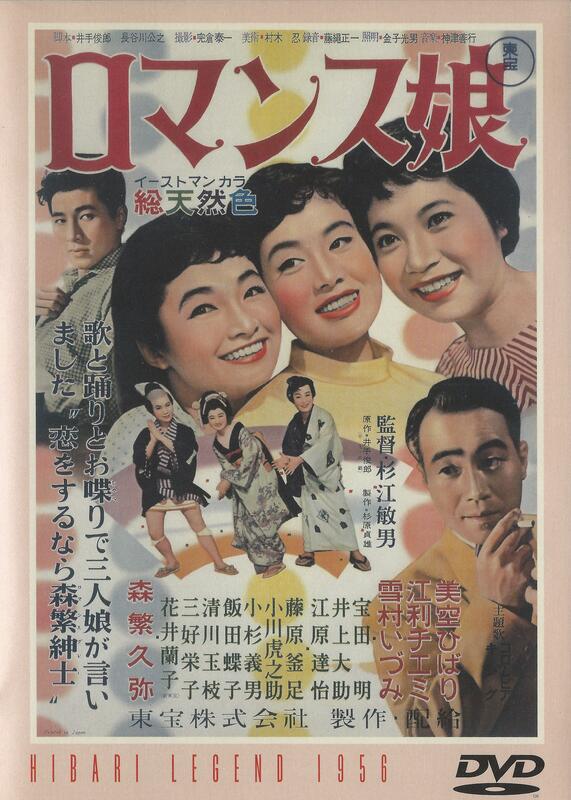 It wasn’t until 2009 that I discovered some of these, including CARMEN COMES HOME (1951), a comedy starring Hideko Takamine that was the very first Japanese color feature, and JANKEN MUSUME (1955), a musical starring “Sannin Musume,” a trio consisting of three popular singers of the time, Hibari Misora, Chiemi Eri, and Izumi Yukimura. 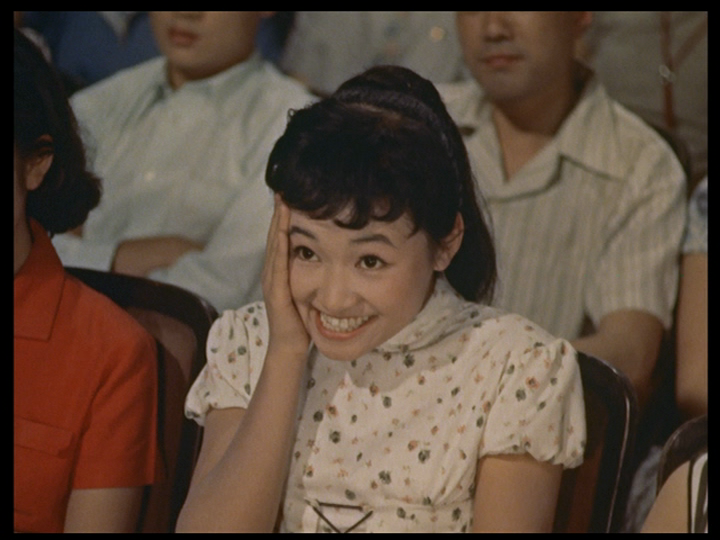 I wrote about JANKEN MUSUME in my J-pop blog on December 2, 2009 and reviewed it on IMDB ten days later. 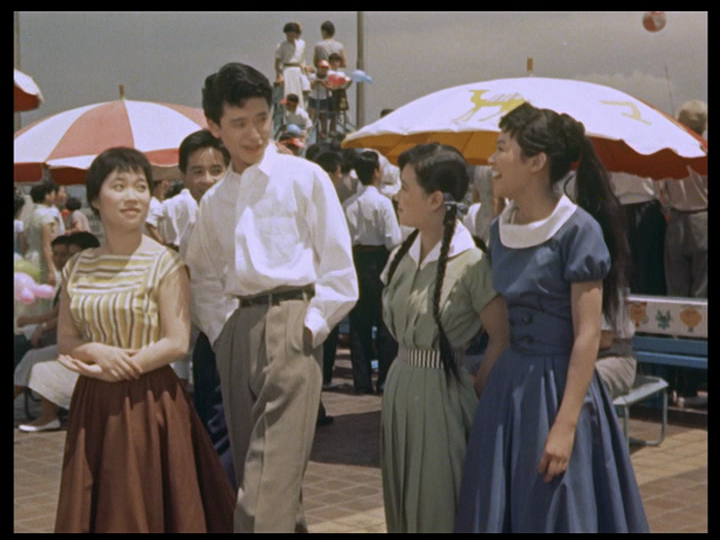 Only this past week have I finally gotten around to seeing the second film in the Sannin Musume series, ROMANCE MUSUME (1956). 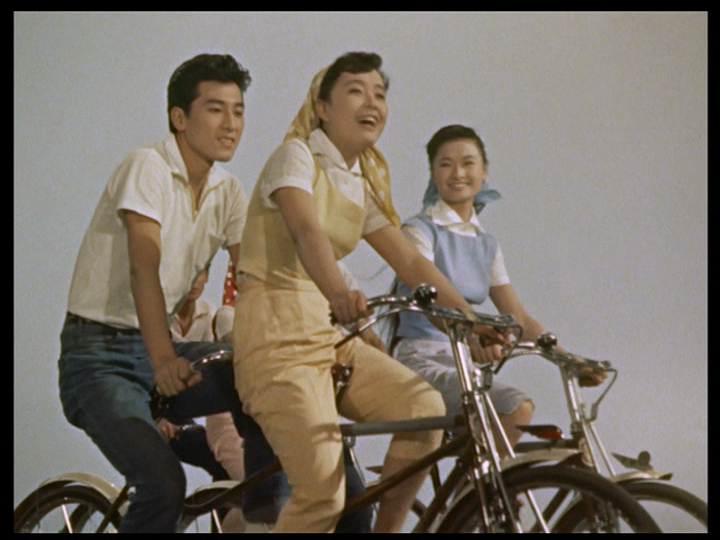 Like JANKEN MUSUME, this one comes without any subtitles, so I miss out on key plot points. 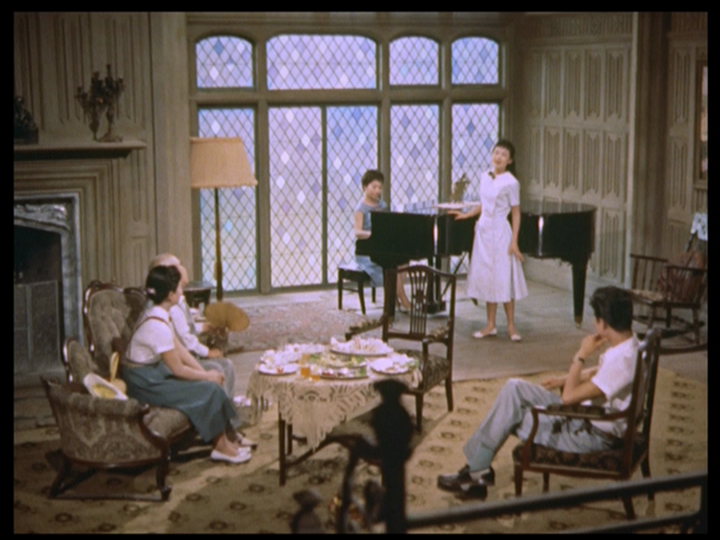 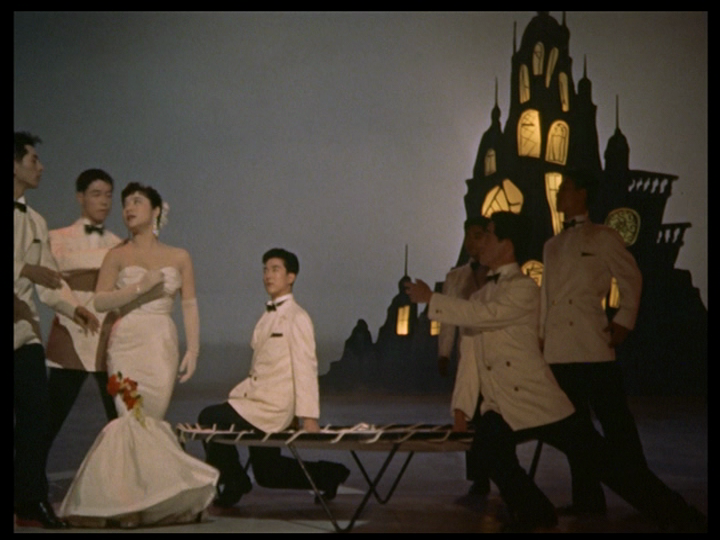 But what I get are some delightful songs and musical numbers and some beautiful Eastmancolor cinematography. 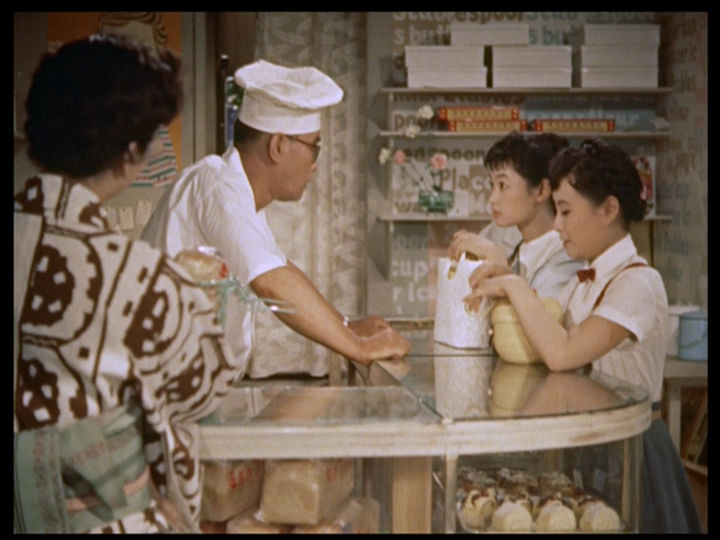 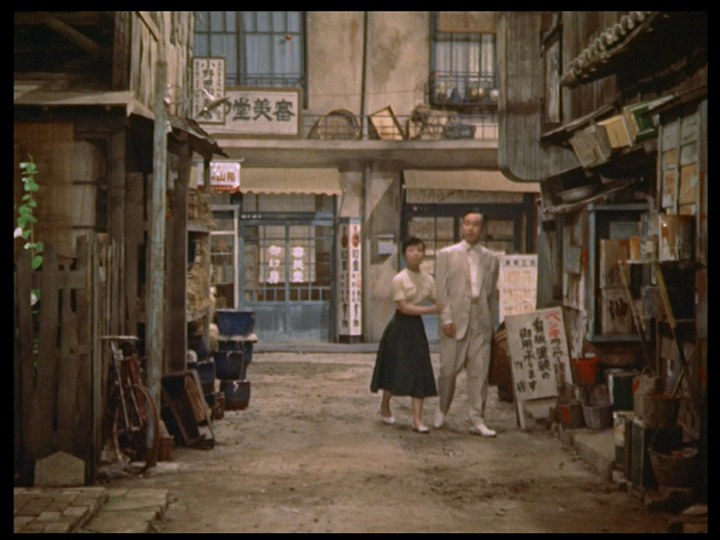 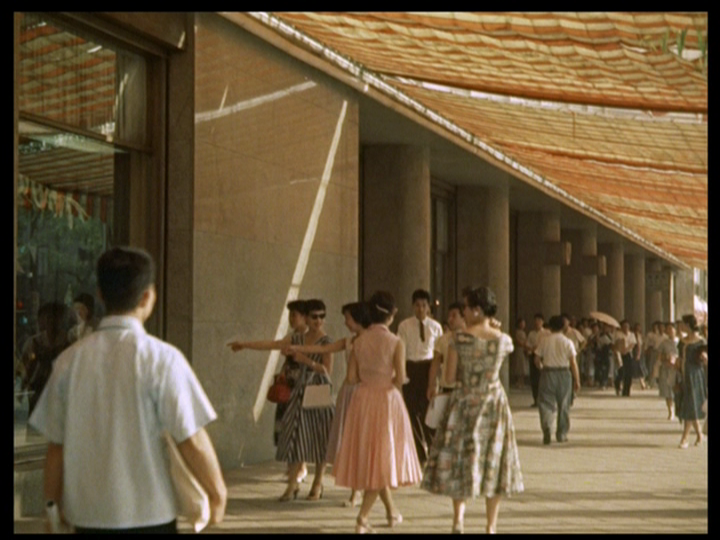 Even though most scenes are shot on Toho studio sets, one does get a sense of contemporary Tokyo in the 1950s, newly prosperous after years of hardship and turmoil after the war. 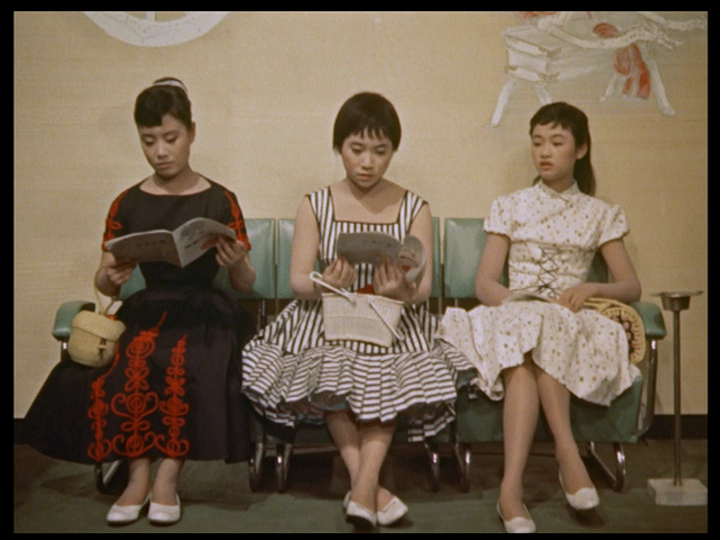 The three girls play high school students who work after school in a department store and whose parents are all shopowners, so we get a sense of how ordinary Japanese lived in those years. 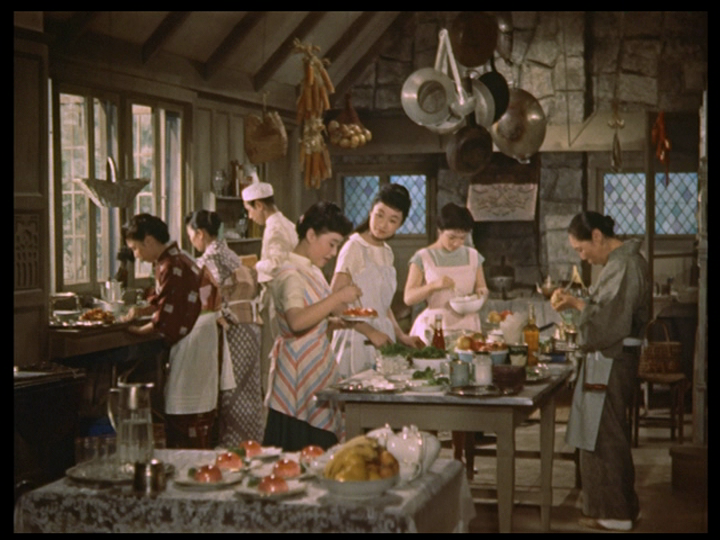 We also get a look at a wealthier household when the girls visit the grandfather (oji-san) of one of their male classmates, who lives in a western-style house on a large piece of property. 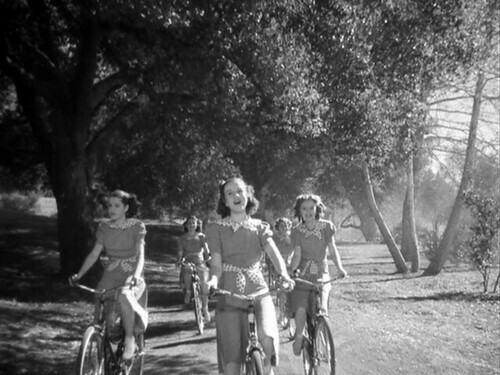 The girls sing ten songs contained in seven musical numbers. 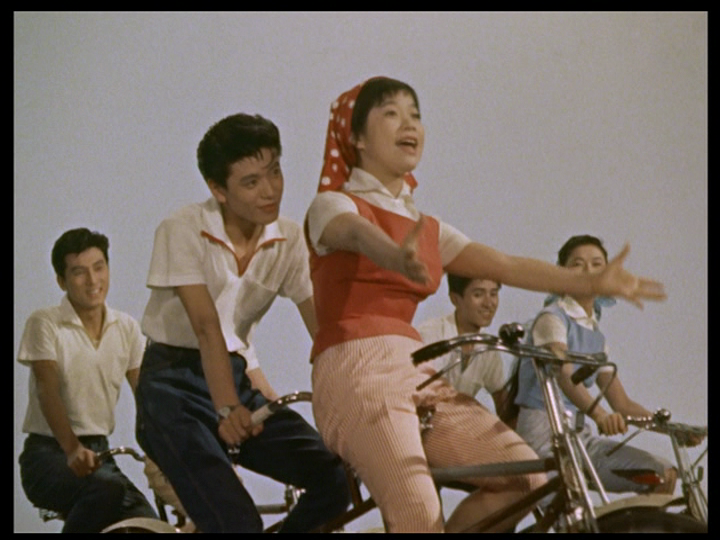 (The six-minute couples-on-bikes finale contains four songs: three solos and one group number.) 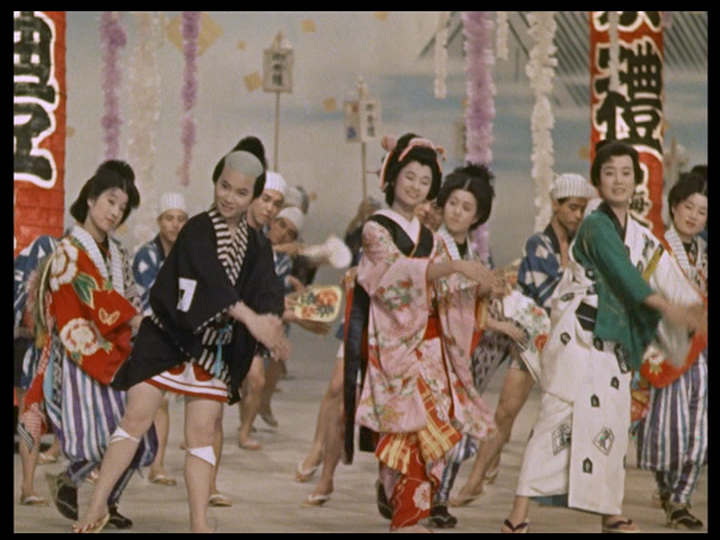 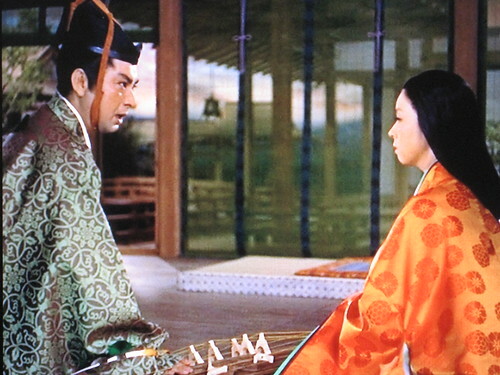 The first number is done in traditional costume by Hibari at a festival (matsuri) on a lavish street set three minutes into the film. 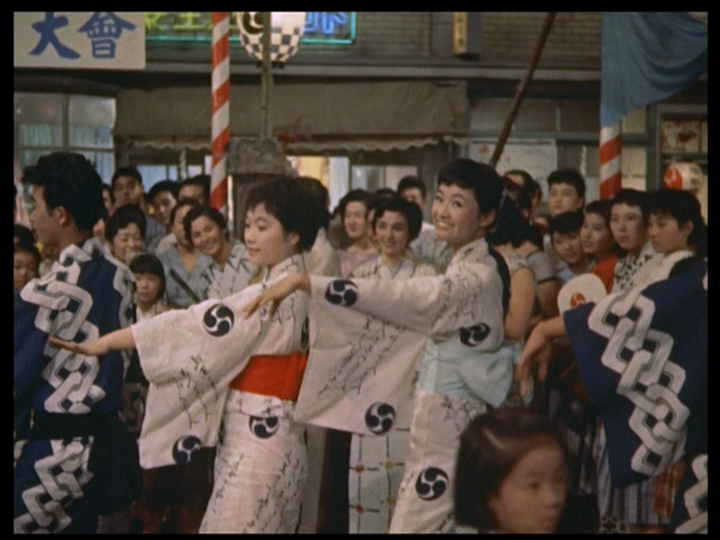 The two other girls, Chiemi and Izumi, are part of the dance troupe. 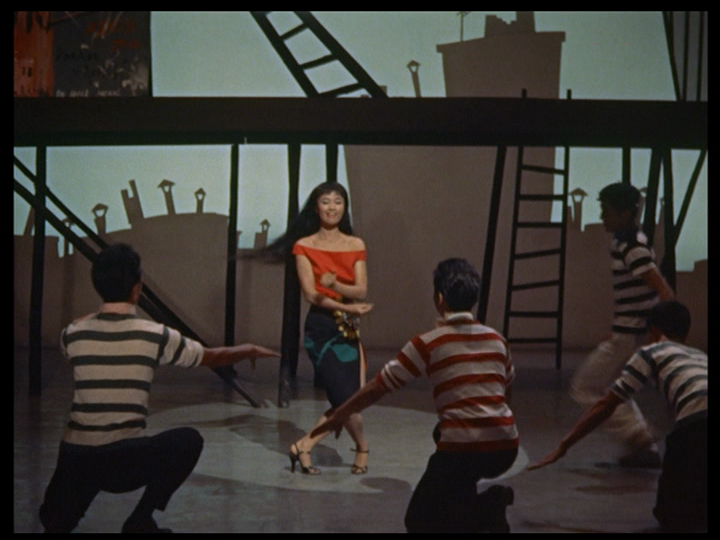 The first song is a Mambo-style number performed by Izumi with male backup dancers. 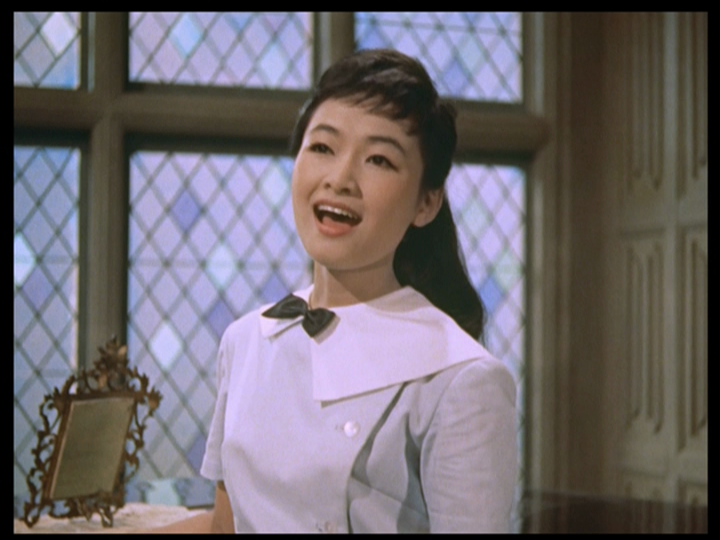 Chiemi’s song includes these English lyrics: “I gave my heart to you in old Lisbon that night / Under the spell of your charms, I felt your arms hold me so tight…” A little research turns up the title of the song, “Lisbon Antigua,” which was a hit for Nelson Riddle in 1956. 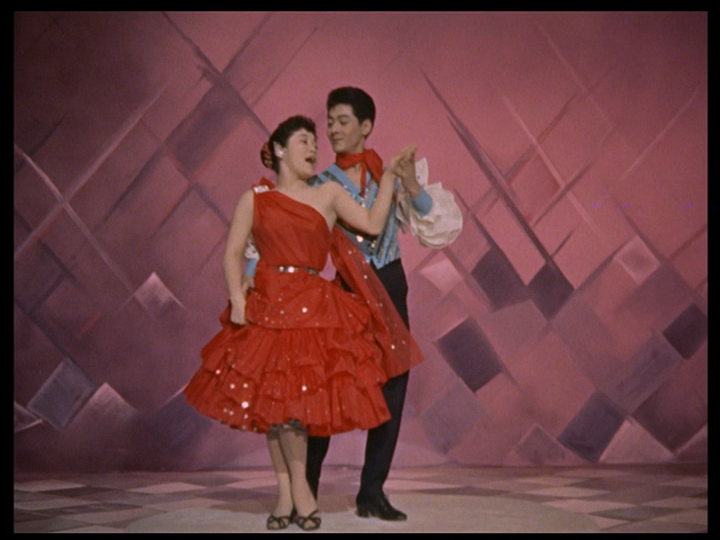 I was unable to determine who might have sung the song on an American recording that Chiemi might have heard. 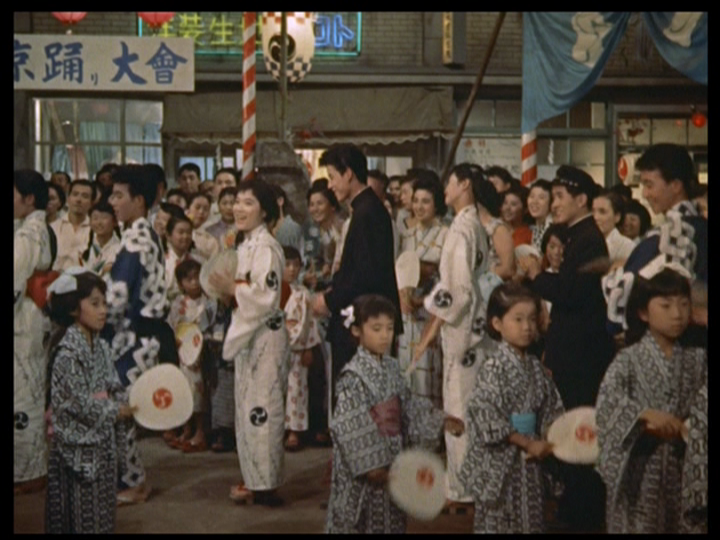 Finally, we get a more traditional Japanese number with Hibari, dressed in full male garb as a samurai. 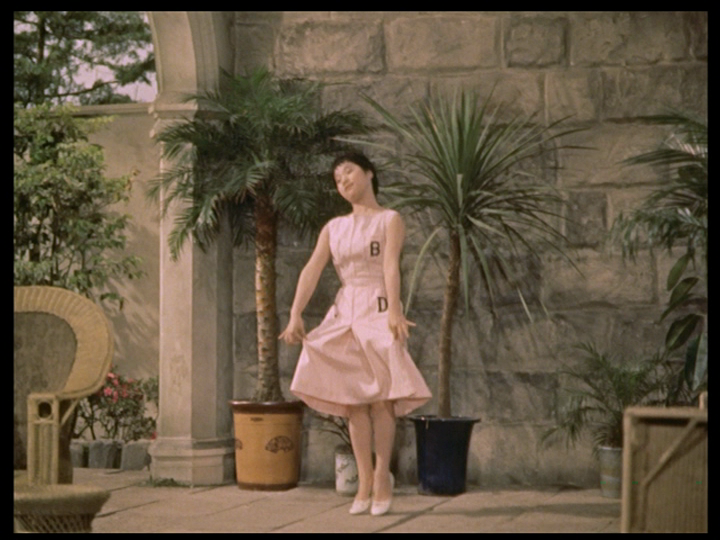 She even sings in a deeper voice than usual. 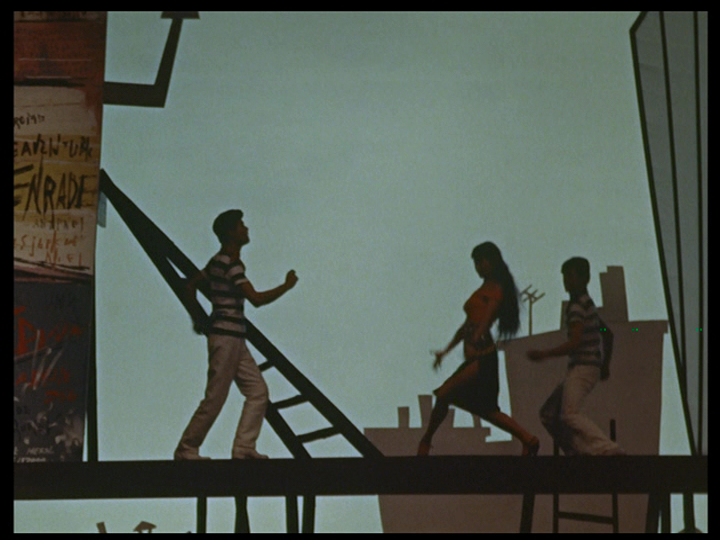 Of the three, two of the songs have English lines in them. 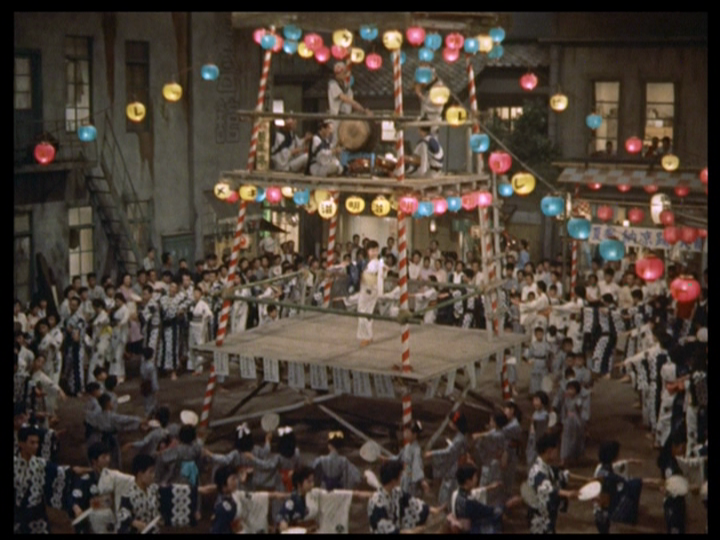 Only Hibari’s traditional song does not. 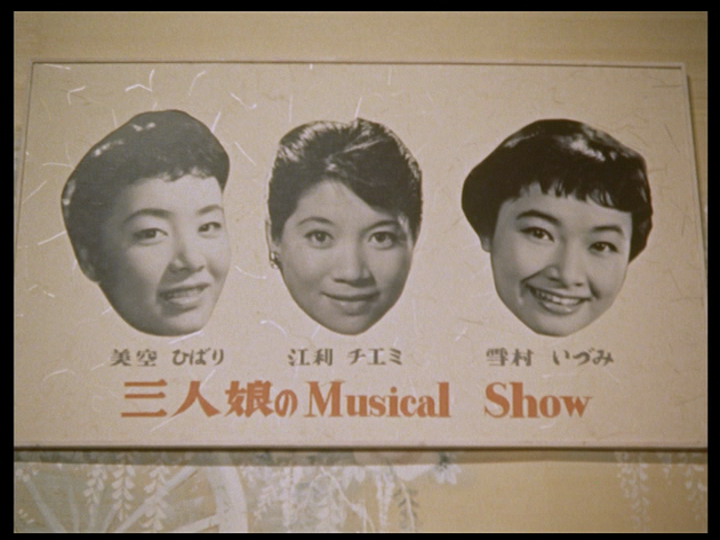 I should point out that in the girls’ previous film, JANKEN MUSUME, there was a similar set of musical numbers that the girls watched themselves perform, but in that case, it was clearly indicated that the girls were fantasizing and imagining themselves on stage. 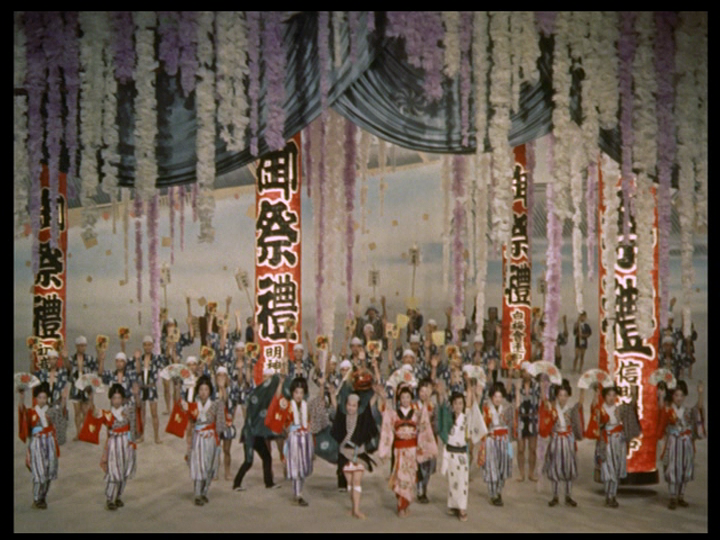 Here, they’re seen entering the theater and sitting under the sign announcing the real performers’ names. 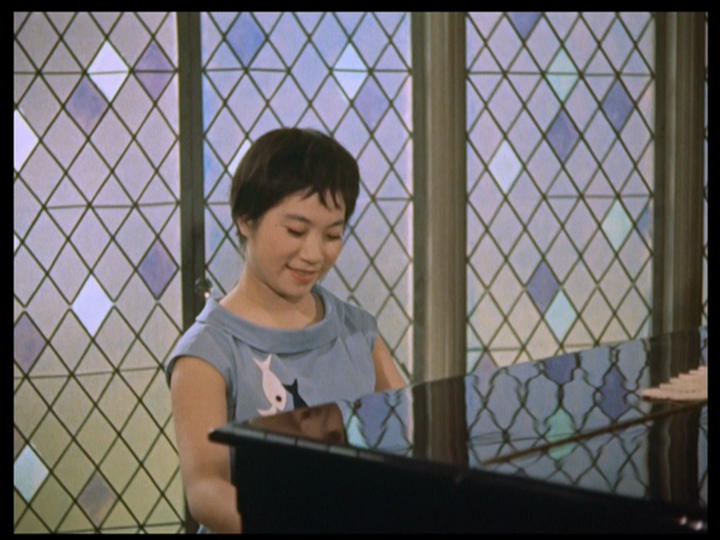 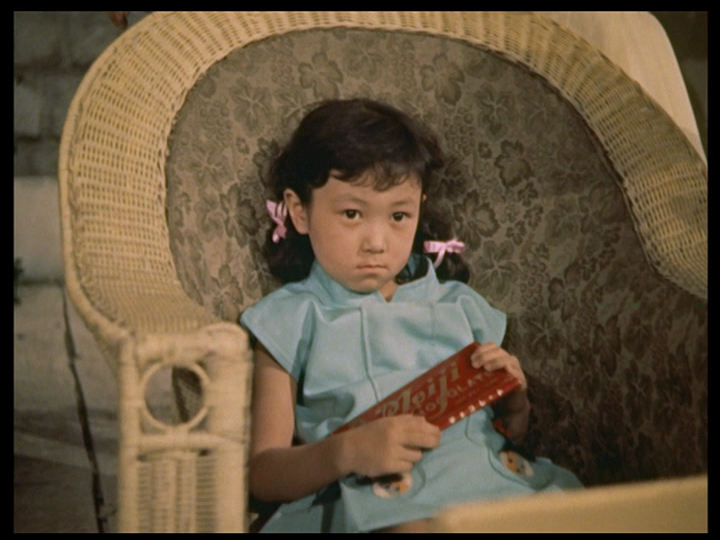 Next, at the 57-minute mark, Chiemi, back at Grandpa’s house, sings a children’s song, “Rock ‘n’ Roll Waltz,” to a shy, unresponsive little girl. 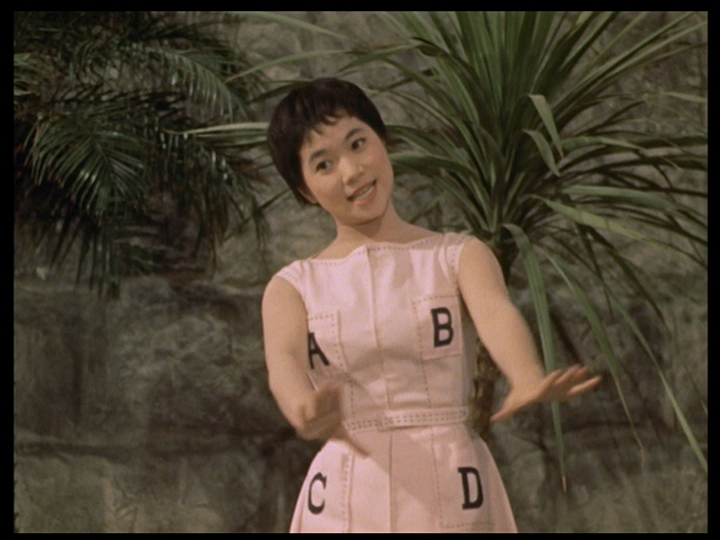 It’s a cute number, but doesn’t quite get the girl to open up. 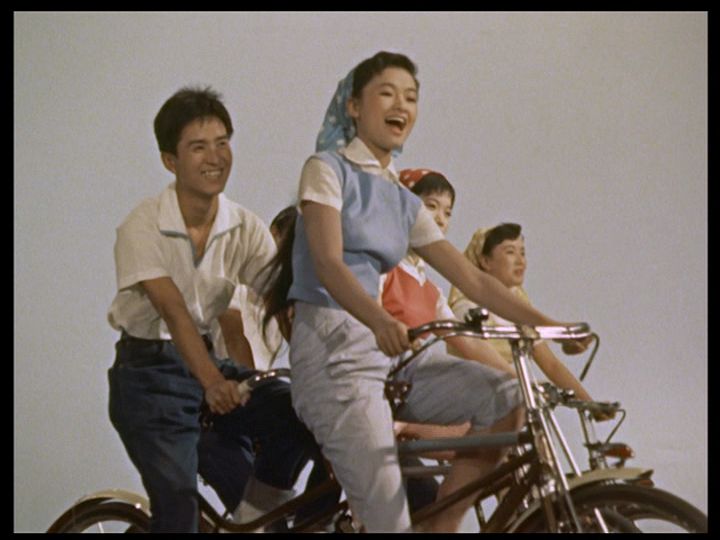 Finally, in the last six minutes of the film, there’s a bike-riding finale where the girls sing while riding bicycles built for two with their boyfriends, neither of whom has played much of a romantic role at all in the course of the film. 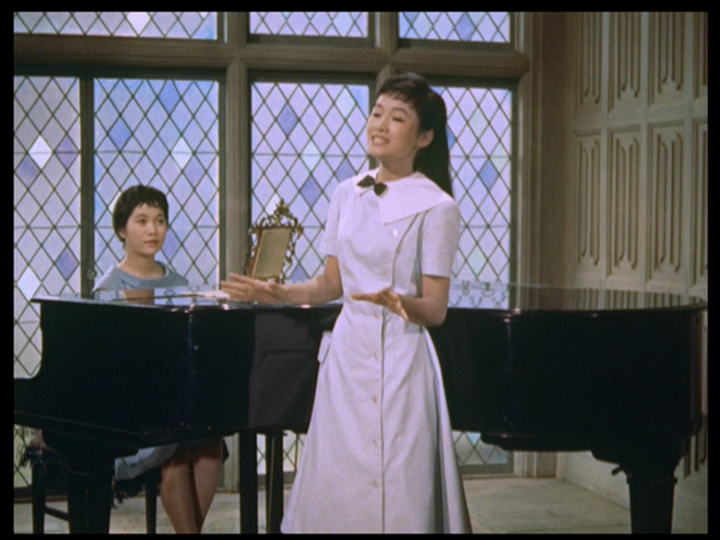 Each girl sings a solo in the finale, followed by the title song which all three girls sing together, the only time they sing together in the course of the film. 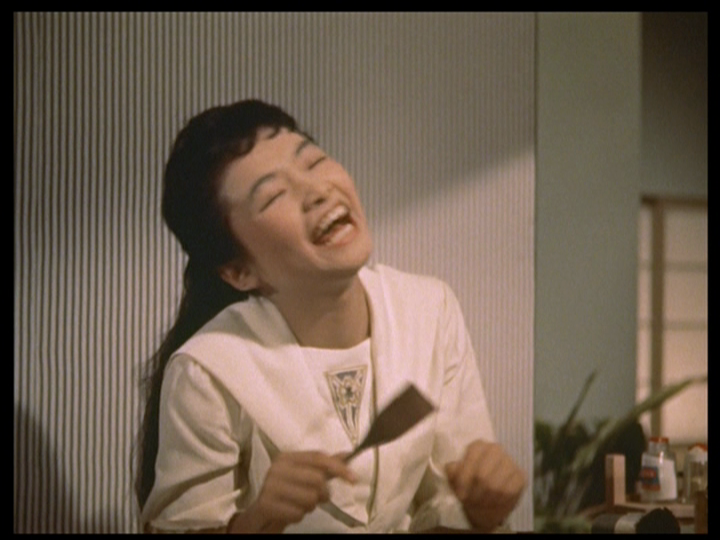 Hibari’s solo is on an album of hers that I own. 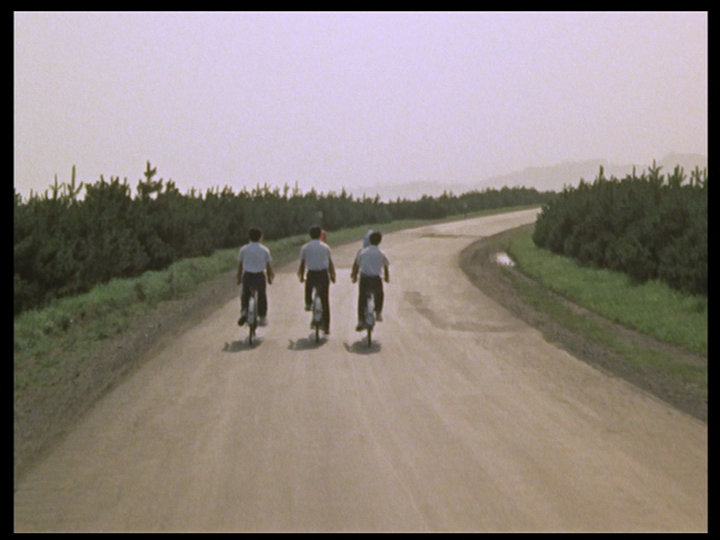 The sequence is done by combining studio-filmed close shots with long shots of them (or doubles, I presume) riding bikes on a country or seaside road. 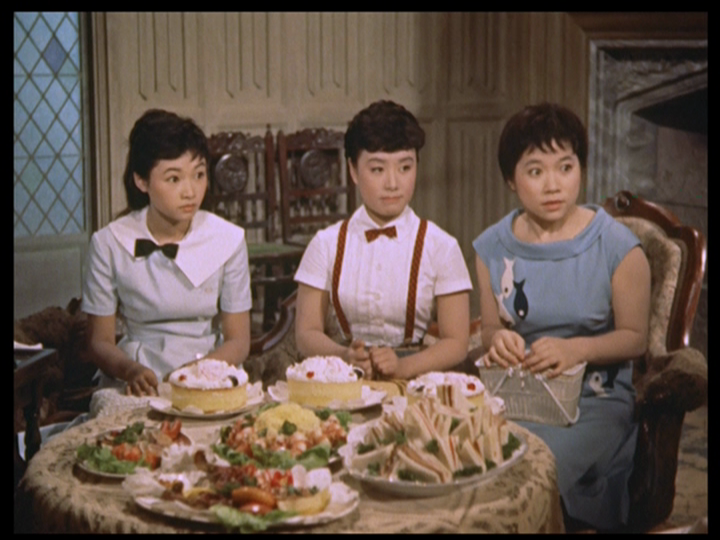 One of the most striking elements of ROMANCE MUSUME is the emphasis on female friendship. 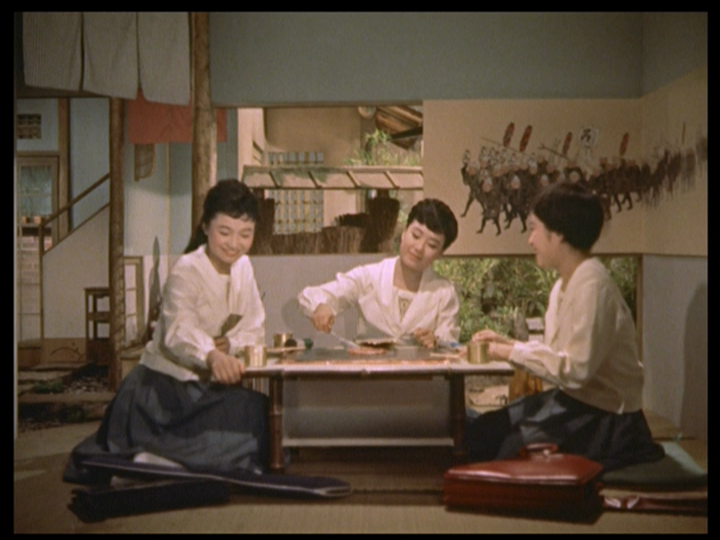 The three girls hang out together and eat together and laugh a lot. 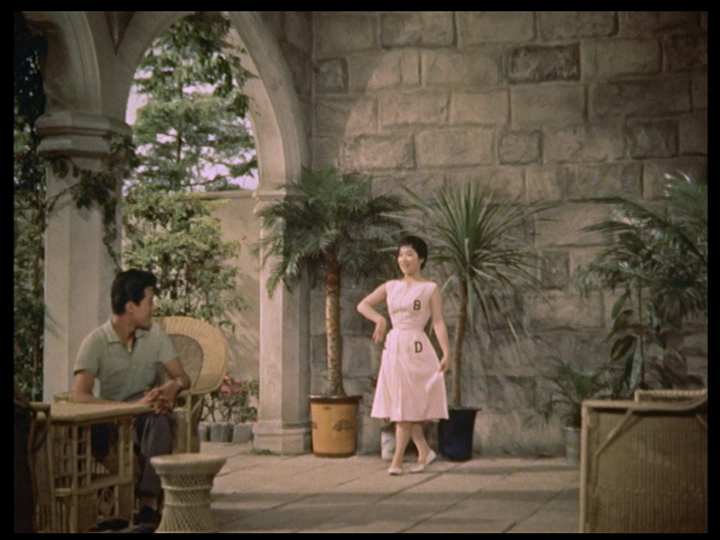 They spend a lot of time doing things together. 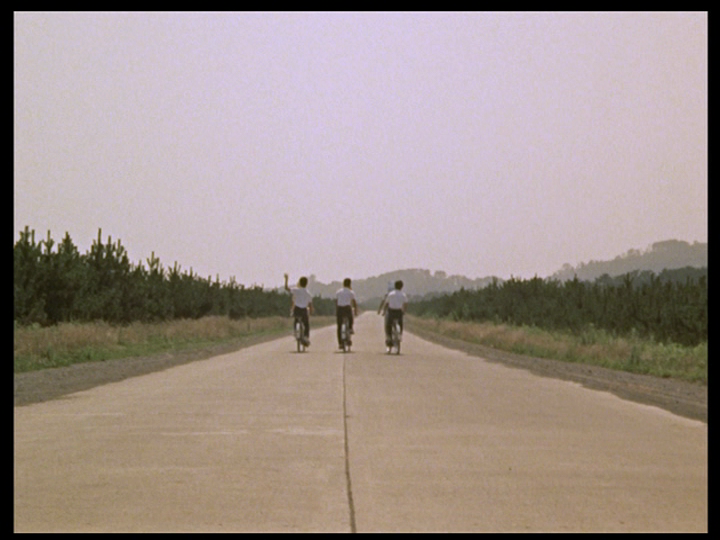 They really enjoy being with each other. 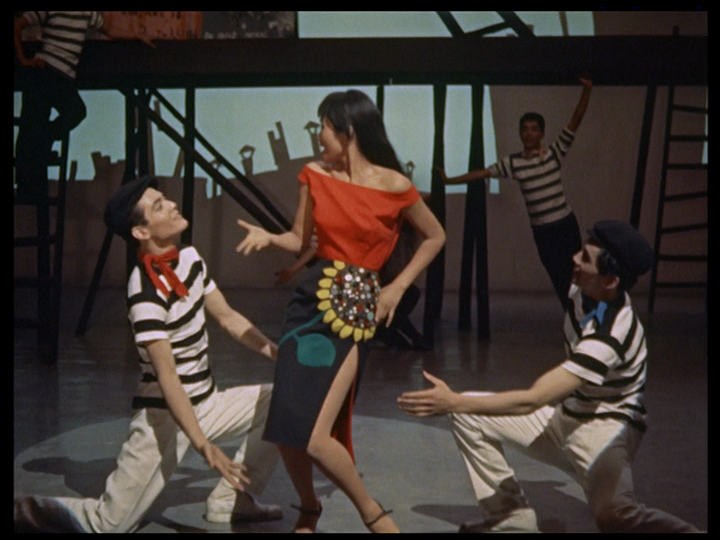 The boys in their life play second fiddle to the girls. 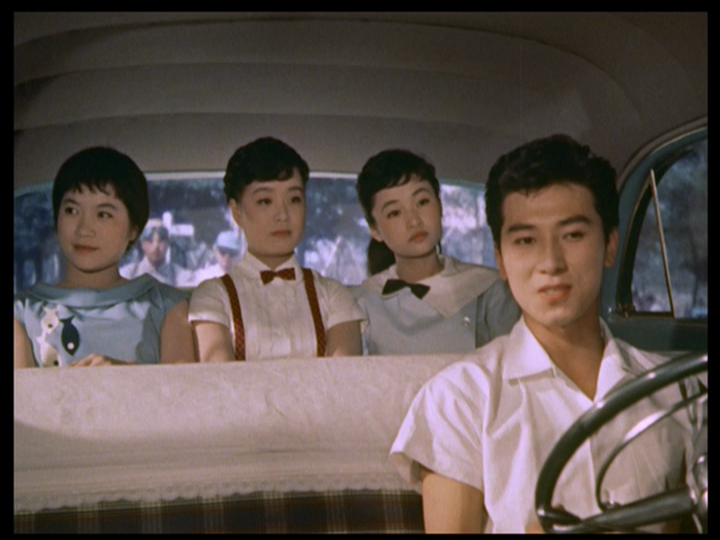 Akira Takarada drives the girls to his Grandpa’s house. 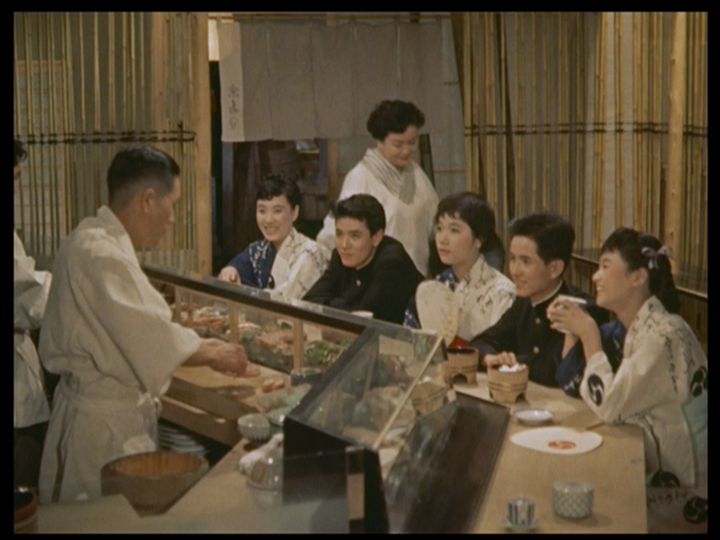 Notice how they all sit in the back with each other. 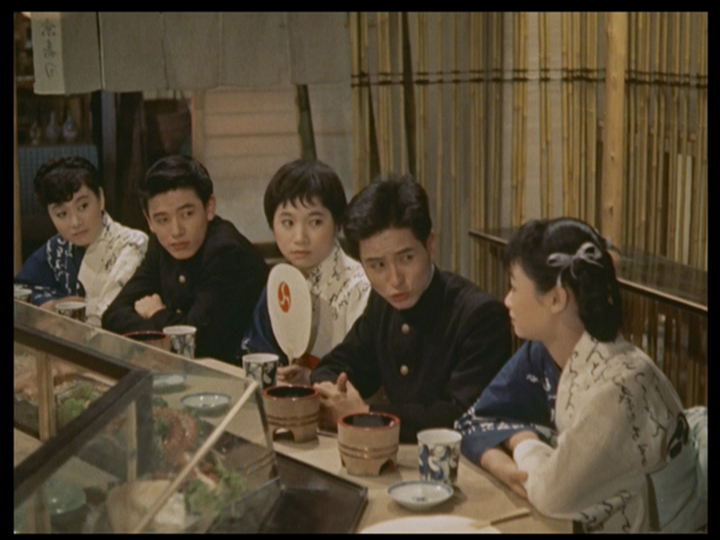 I don’t know the actors who play Chiemi’s and Izumi’s partners. 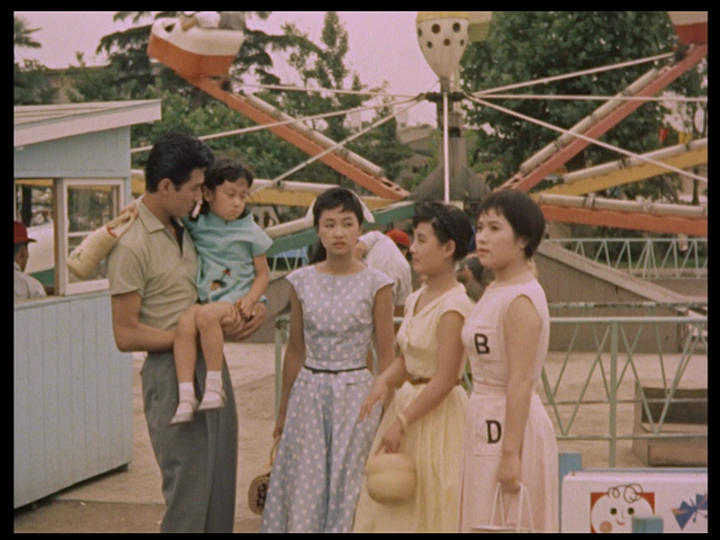 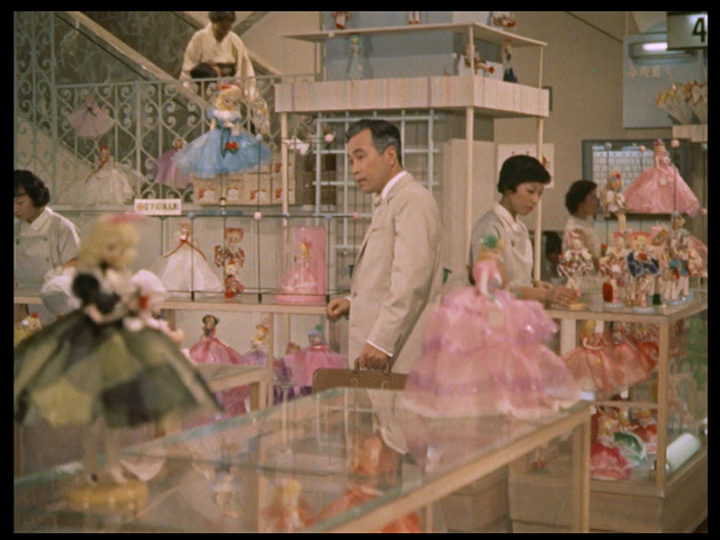 I love the glimpses of modern-day Tokyo seen in the film, whether on location, like the amusement park they go to with the little girl, or in studio sets that recreate the department store where the girls work and the shops and streets where their parents work. 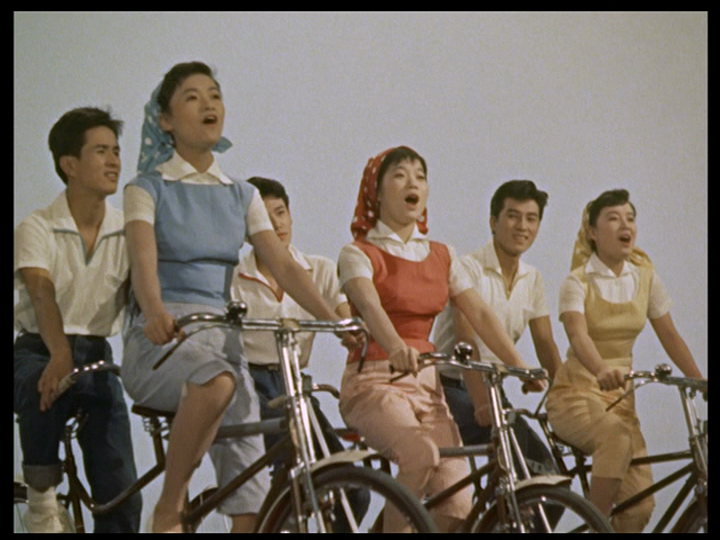 Hibari is the only one who doesn’t sing any lyrics in English in ROMANCE MUSUME. 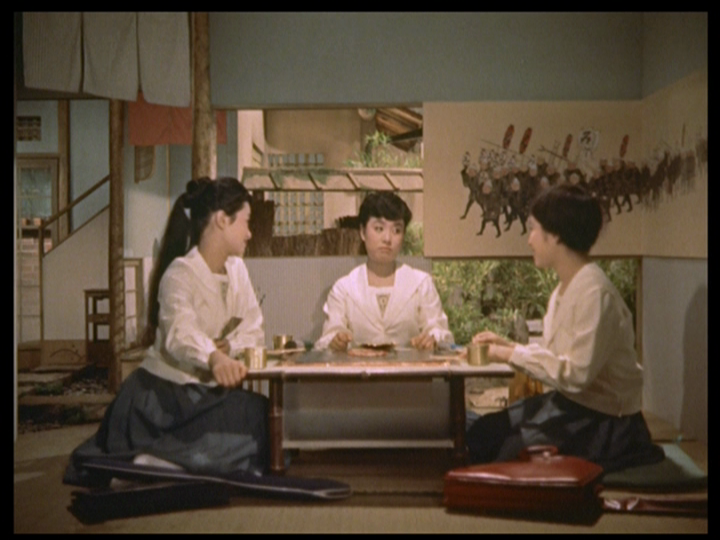 Of the three girls, Izumi Yukimura is still with us as of this writing. 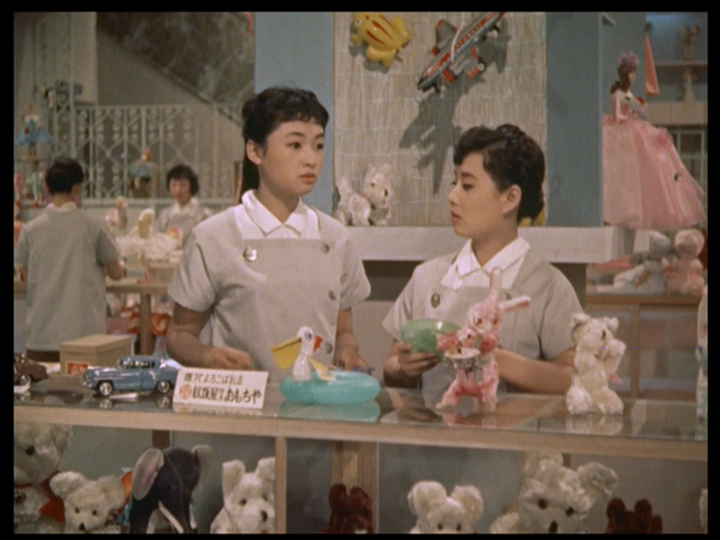 Chiemi Eri died at the age of 45 in 1982 and Misora died at the age of 52 in 1989. 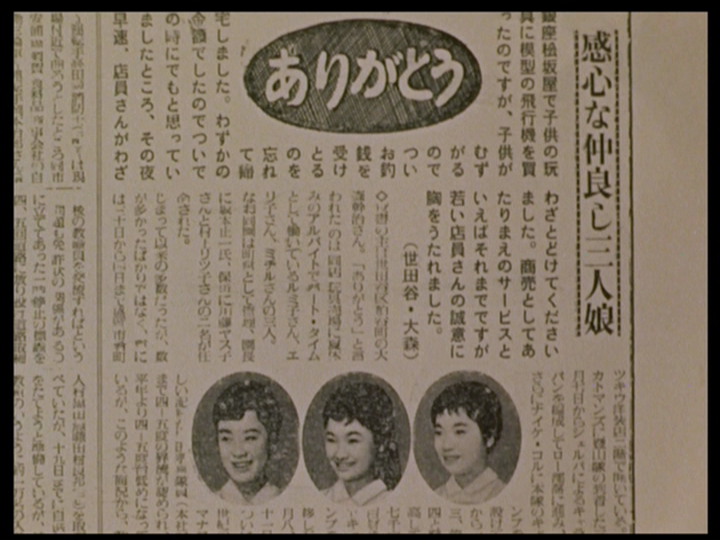 All three were born in 1937. 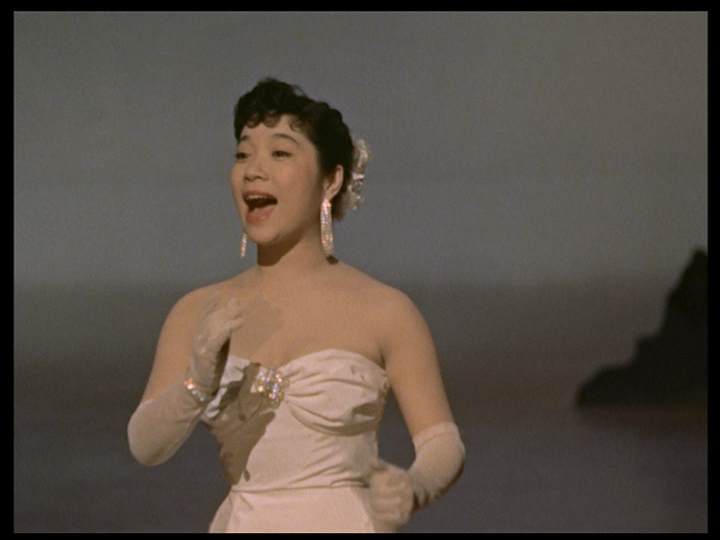 Hibari Misora was the top recording star in the postwar era in Japan. 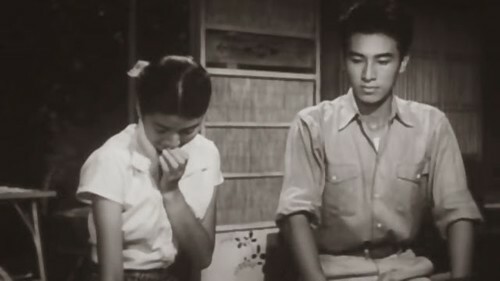 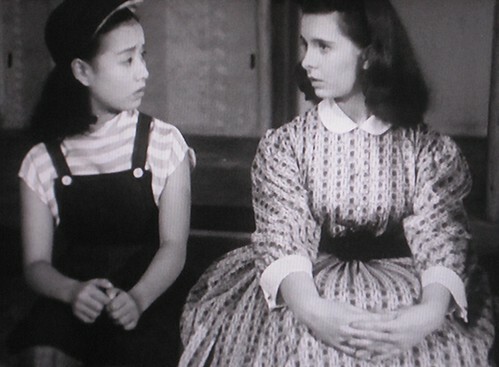 She starred in the very first Japanese production to feature an American star, FUTARI NO HITOMI (1952, aka GIRLS HAND IN HAND), which co-starred Margaret O’Brien, who was the same age. 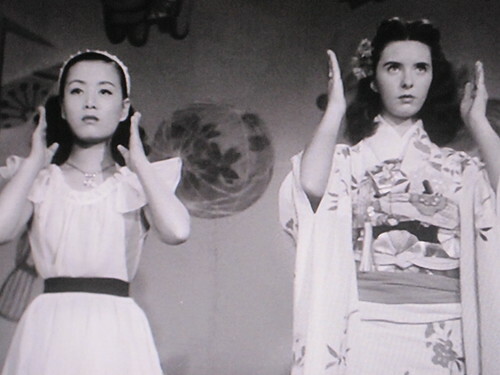 To me, Misora is the Japanese Deanna Durbin, Judy Garland, Billie Holliday, Ella Fitzgerald and Rosemary Clooney rolled into one. 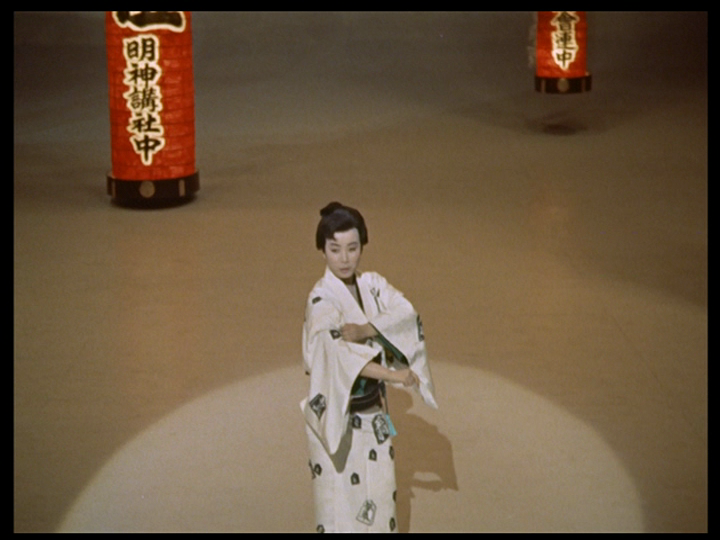 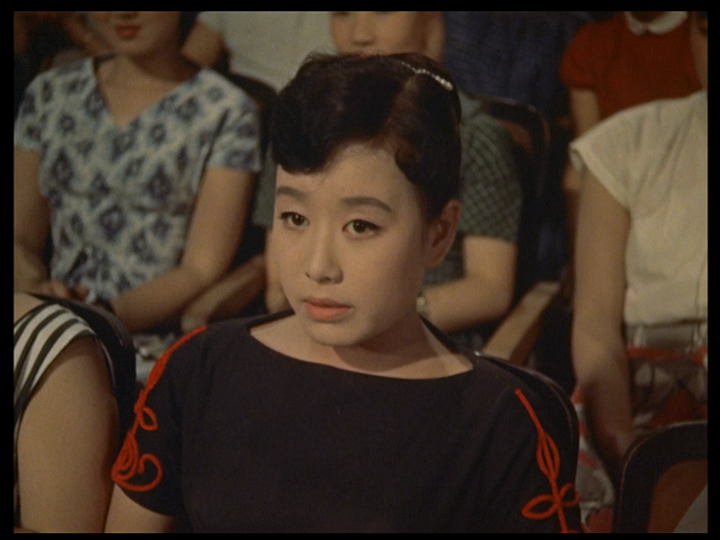 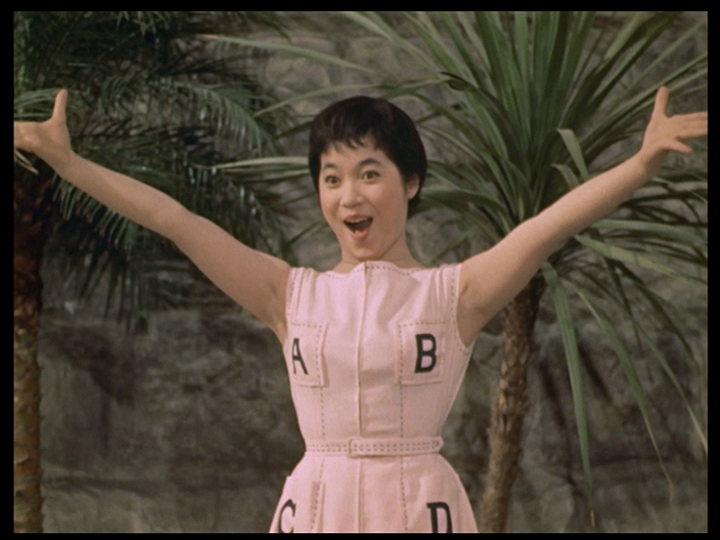 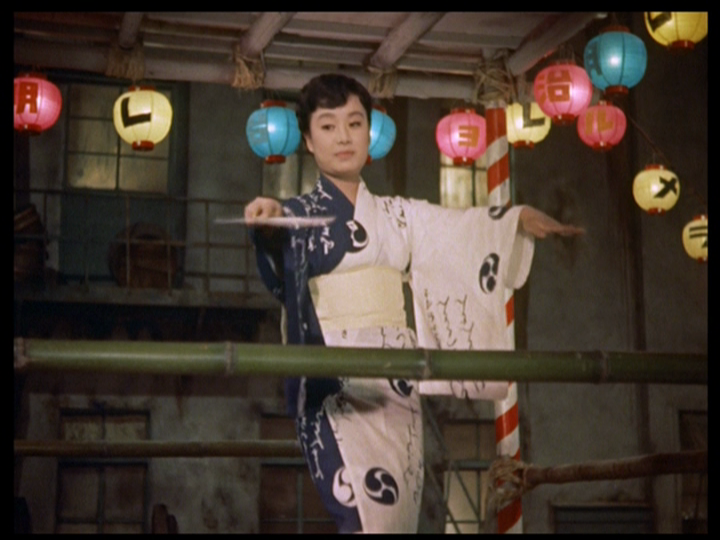 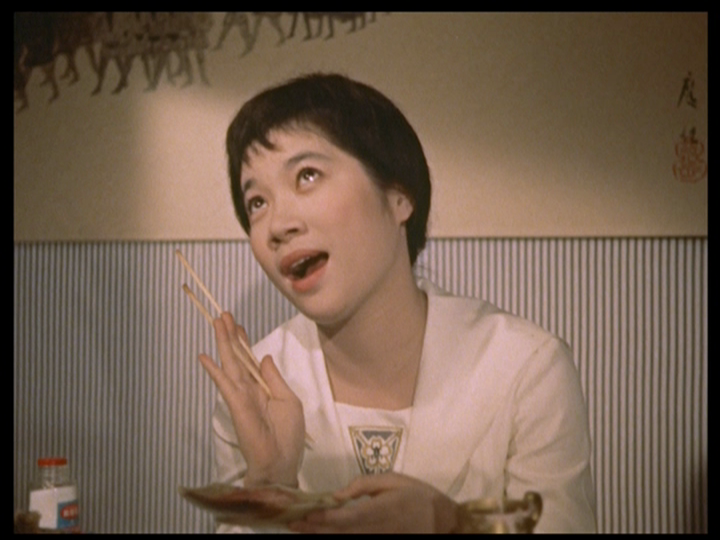 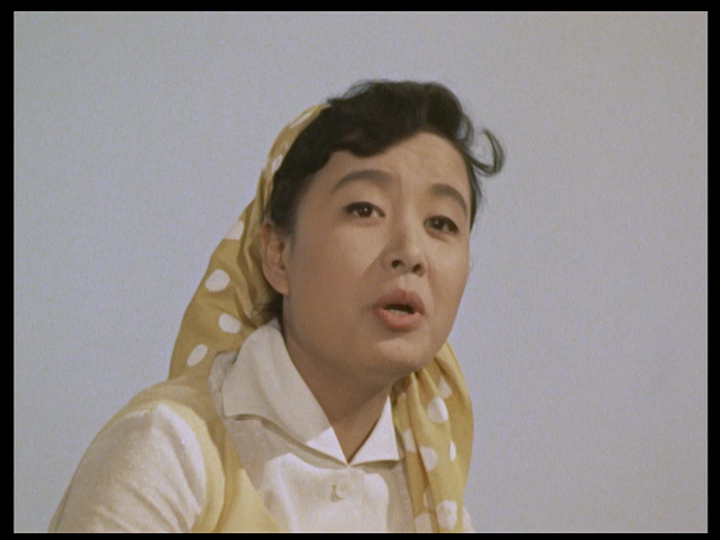 Her role in the restoration of popular culture in postwar Japan cannot be overstated. 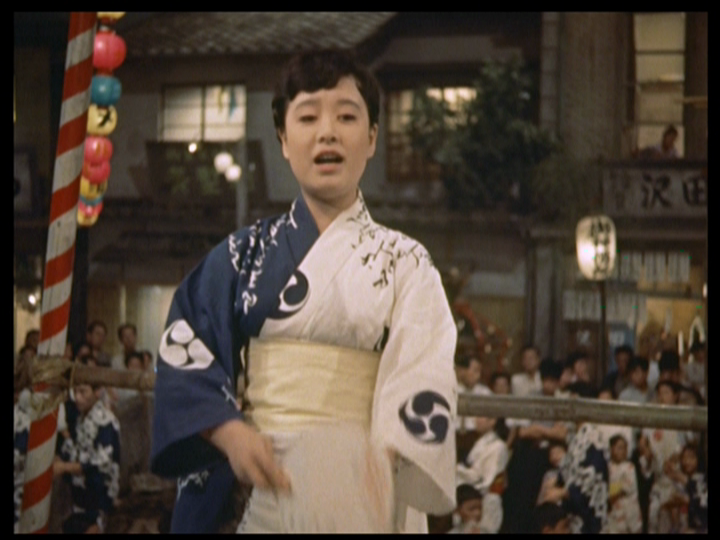 She sang American-style boogie woogie, as well as age-old Japanese festival songs. 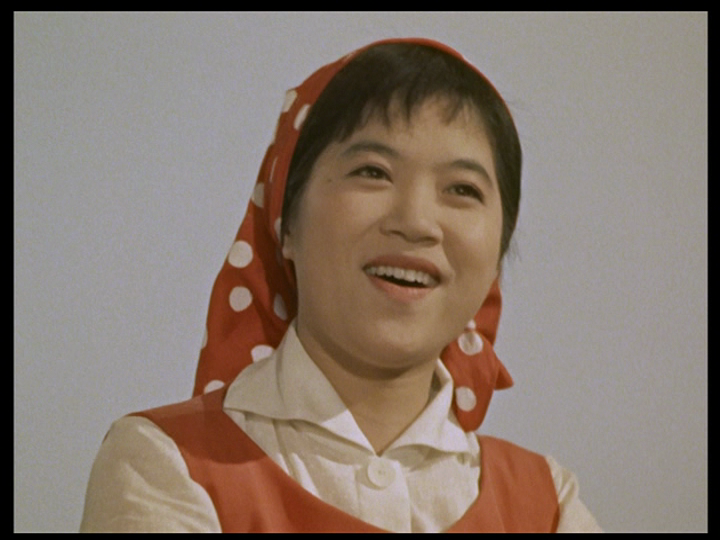 Her singing bridged the gap between east and west and helped pull the country together during a difficult time. 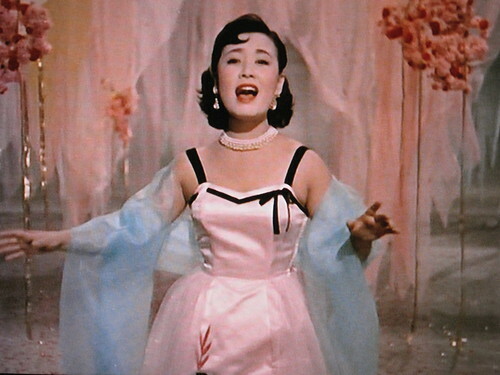 Listening to her older albums is like taking a time machine through certain parts of the 20th century and then back into pre-modern Japan through the Tokugawa era and back into the feudal era. 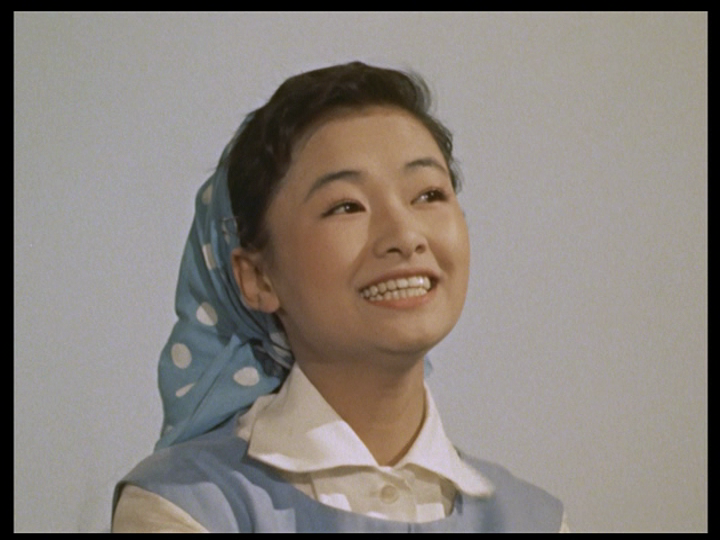 I now have eight or nine of Misora’s CD albums, two DVD sets of TV appearances and five of her movies on DVD (all in Japanese with no subtitles). 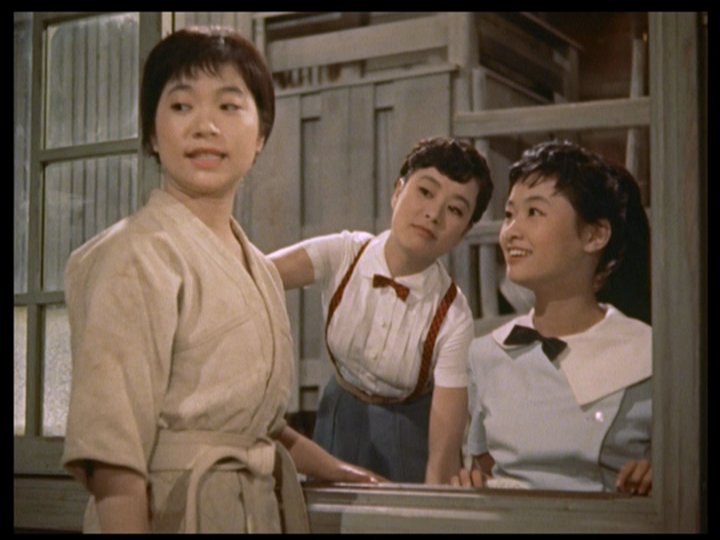 I have yet to see the two remaining Sannin Musume movies: OHATARI SANSHOKU MUSUME (1957, aka ON WINGS OF LOVE, the first movie in Tohoscope), and HIBARI CHIEMI IZUMI 3NIN YOREBA (1964), although I now have the latter on DVD. 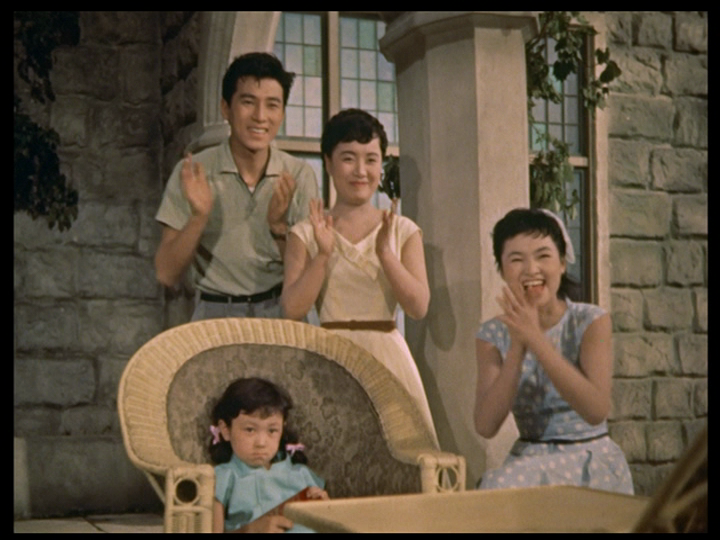 All four of the films were directed by Toshio Sugie, who also directed entries in the Three Dolls series starring Reiko Dan, beginning with THREE DOLLS IN COLLEGE (1959). 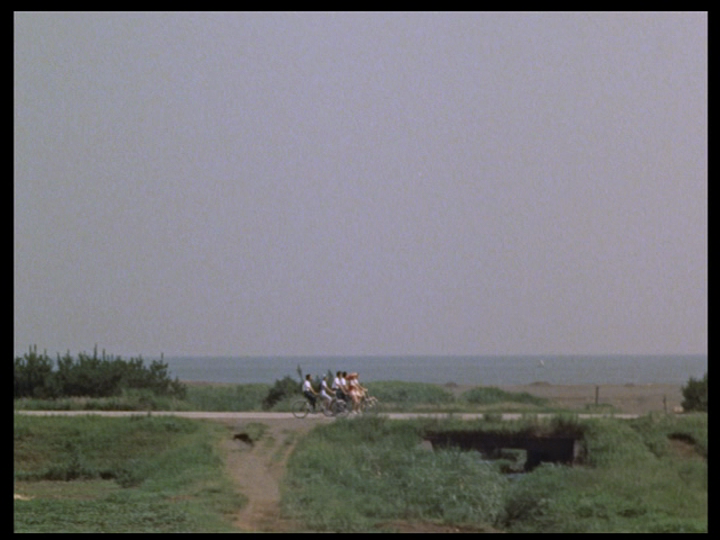 I’d like to see those films as well. 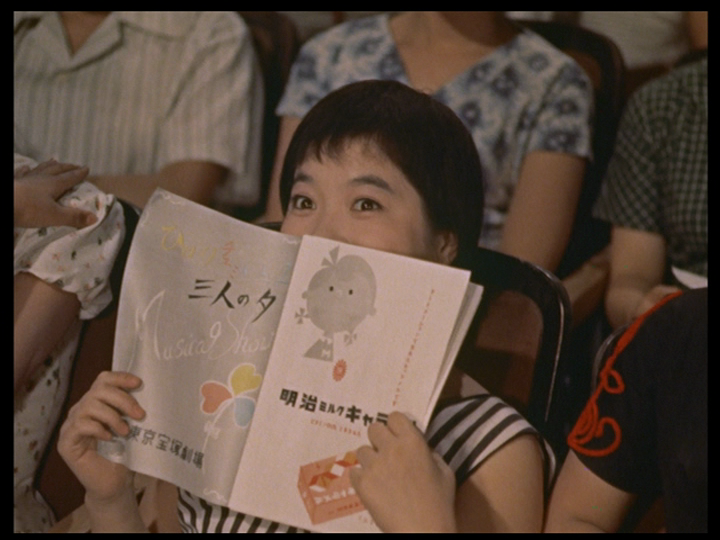 Wouldn’t it be nice if this whole body of work came to the west with English subtitles? 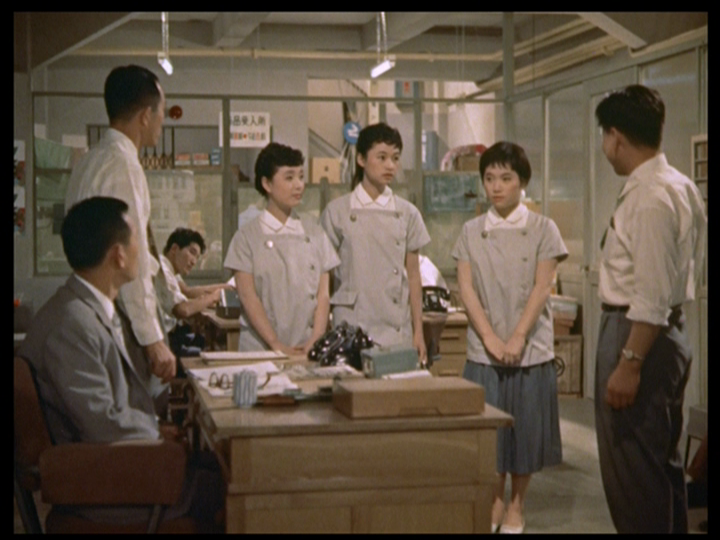 And while I’m at it, it’s time to begin seeking out recordings of both Chiemi Eri and Izumi Yukimura, something that occurred to me as I watched this film. 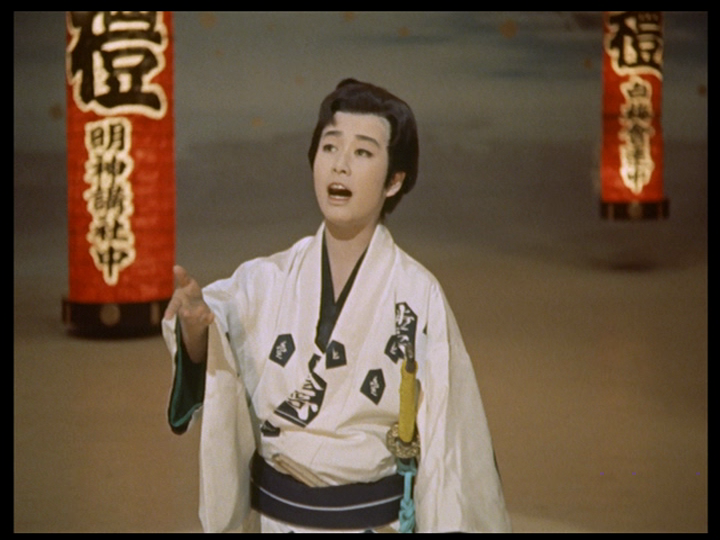 Yukimura had the best English pronunciation of the three, at least while singing, and I’m curious to hear what English-language recordings she might have made, as well as anything else. 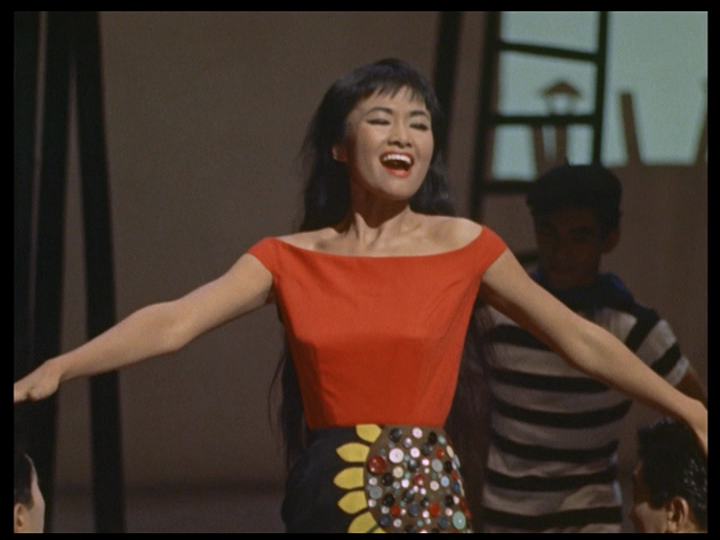 Yes, all three performers have a presence on YouTube, but I love exploring singers’ work on albums that someone made the effort to curate and put together. 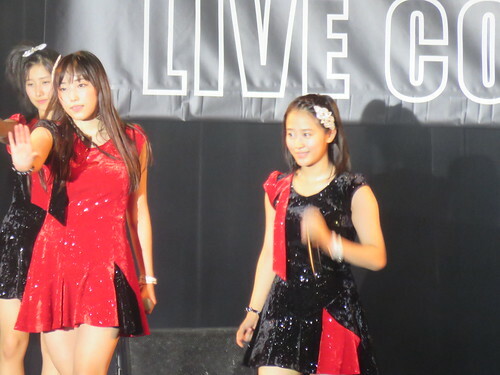 I was first intrigued by Sannin Musume because I thought the trio might have been a precursor of Morning Musume, a contemporary J-pop act that I’ve been following for the last nine years. 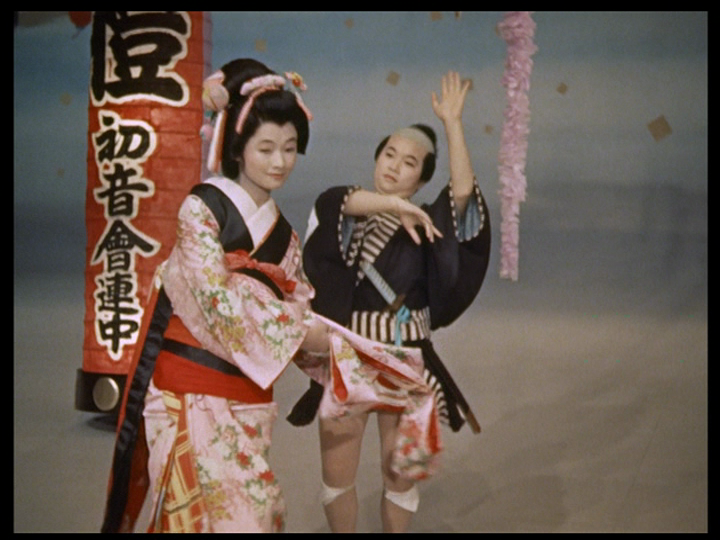 I didn’t find any connection between them, although Misora’s traditional festival numbers in ROMANCE MUSUME look forward to a 2001 music video called “Dancing! 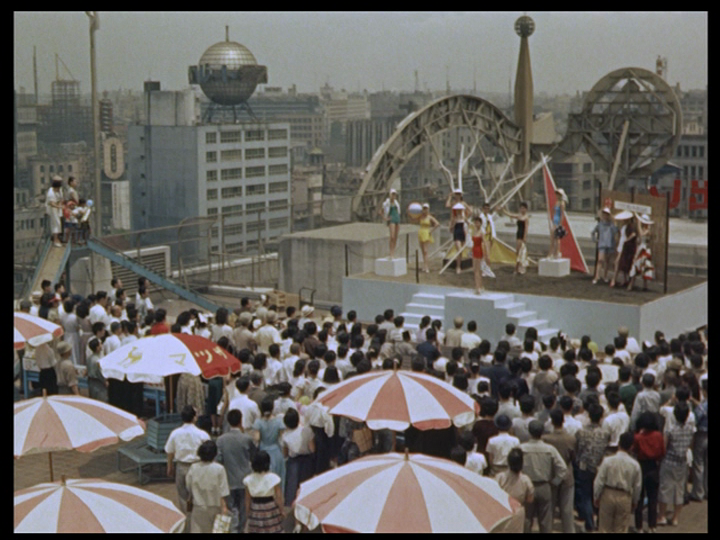 Natsu Matsuri” by a special unit called 10nin Matsuri which included members of Morning Musume. 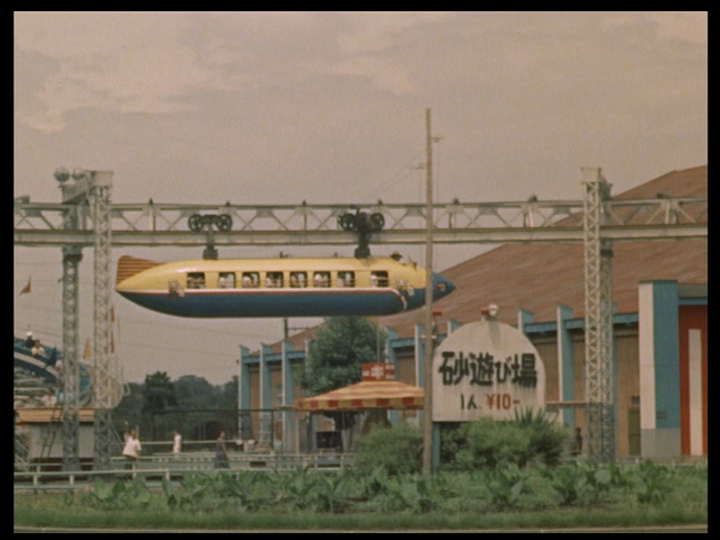 So it all comes full circle. 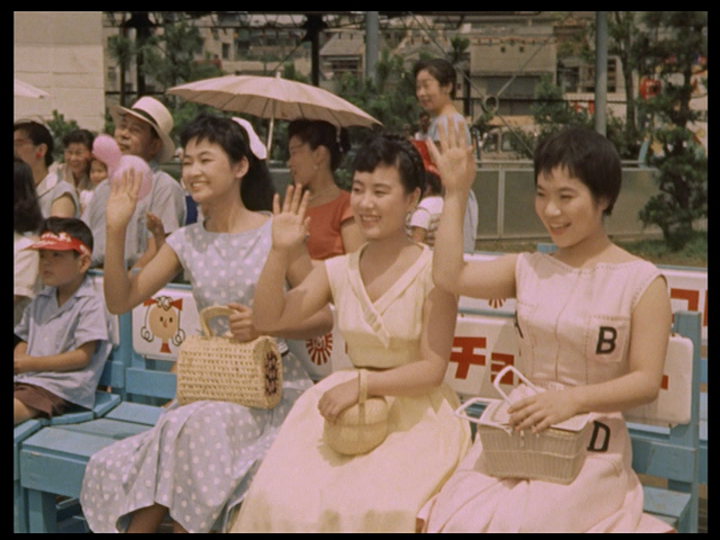 For the record, musume means girls or daughters. 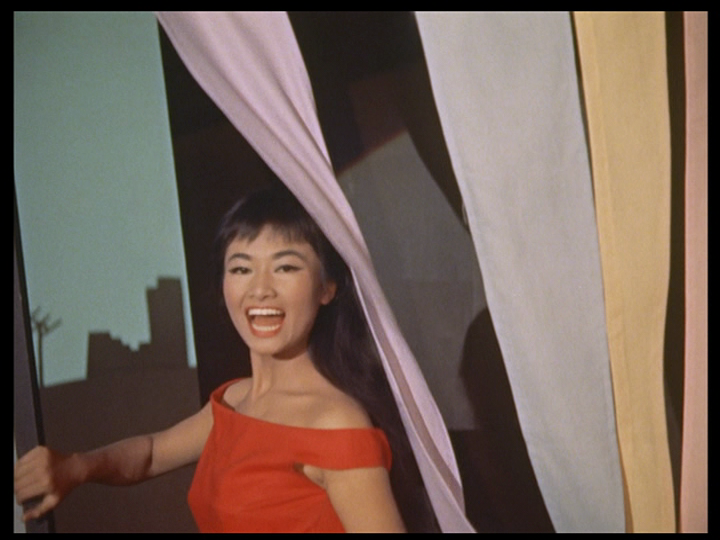 Sounds like a show and a half, Brian. 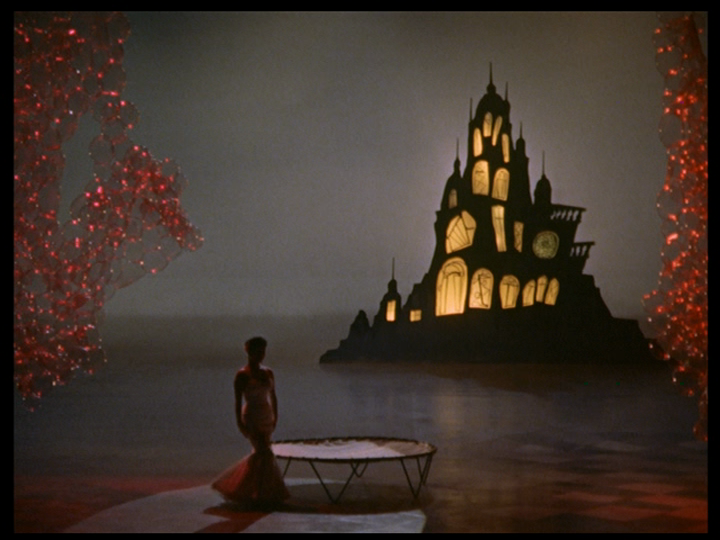 Very well presented.